Great American Bake Sale is the perfect fundraising activity to do with colleagues. It’s a fun way to get to know your office-mates, take a break from the daily tasks of office life and make a huge impact in the effort to end childhood hunger in America. You can hold a bake sale in your office or take it to the streets and show your community that your entire office is dedicated to a cause. 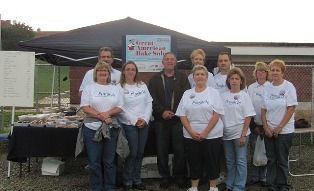 In 2011, Share Our Strength corporate sponsor, Pinnacle Foods, hosted “The Pinnacle Foods Bake Sale Challenge”, an internal employee engagement campaign encouraging employees to host bake sales in their communities using their Duncan Hines and Comstock products. 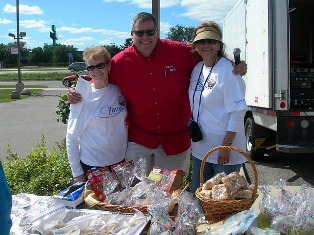 Pinnacle Foods employees hosted bake sales at local community locations like supermarkets and at community events such as car shows, parades and fairs. They also hosted a few internal bake sales. More than 500 employees participated by hosting more than 45 bake sales throughout the country, spending approximately 20,000 volunteer hours baking, selling and supporting the bake sales. The top fundraising location and randomly selected participants were awarded with gift cards. Their initial goal was to raise $25,000 from July through October. But because of the strength of their employees, they raised more than $33,000! Build a bake sale team involve everyone who would like to help, from interns and administrative staff to executives. The best location for your bake sale will be somewhere with high foot traffic, like the lobby or cafeteria. If you don’t have a location for your bake sale, consider hosting a mobile bake sale; go desk to desk selling your baked goods. Pre-Order Bake Sale - take orders in your office ahead of time and deliver goods. Use your company’s communication resources such as company emails, intranet sites, bulletin boards and newsletters to get the word out about your bake sale. Most companies have a matching gift program. Check with your HR department to see if your bake sale is eligible for the program. Check out more helpful tips here.